Abstract: Objective To compare the effects of two volume pre-expansion methods, namely that using 6% hydroxyethyl (Voluven, VOL) and that using lactated Ringer's solution (LR), on perioperative hemodynamic changes within elderly patients who underwent gastrointestinal neoplastic discharge.Methods Forty elderly patients aged 60 to 75 years who underwent gastrointestinal neoplastic operation were selected. These patients were randomly divided into two groups (R and V) according to American Society of Anesthesiologists' (ASA) Physical Status Classification System gradesⅠandⅡ. Thereinto, 20 patients were assigned in each group to receive either lactated Ringer's solution 7 mL/kg or 6% hydroxyethyl 7 mL/kg (10 to 15 mL/min). Cardiac function, including blood pressure (BP), heart rate (HR), cardiac index (CI), central venous pressure (CVP), stroke volume index (SVI), cardiac output (CO), system vascular resistance index (SVRI), and stroke volume variation (SVV), was monitored using the Vigileo/FloTrac system (Edwards Lifesciences, Irvine, CA). Monitoring and recording in each group were performed at 7 time points as follows:T0 (5 minutes after admission to the operating room), T1 (after volume infusion), T2 (immediately after induction), T3 (3 min after induction), T4 (during intubation), T5 (5 min after intubation), and T6 (10 min after intubation).Results During the induction period and after the intubation period, systolic blood pressure, CO, CI, and SVI were markedly decreased, with significant differences between the two groups (P < 0.05). Diastolic blood pressure, HR, and CVP were associated with a decreased trend during the induction period and associated with an increased trend after the intubation period (P < 0.05, respectively). The peripheral vascular resistance index (SVRI) showed a significant increase after the intubation period, from T4 to T6, with a significant difference between the two groups (P < 0.01). 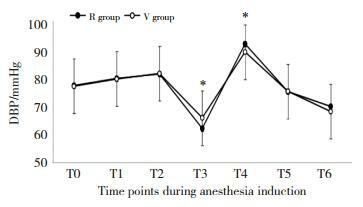 Intraoperative infusion and urine volumes were significantly higher in the R group than in the V group (P < 0.01).Conclusion The effect of preinduction volume expansion with 6% hydroxyethyl starch on the prevention of hemodynamic disorder is better than that of lactated Ringer's solution. 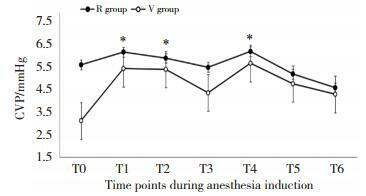 Application of SVV by preloading of a 6% hydroxyethyl solution observably reduces the summation of the volume infusion during surgeries. 1) P < 0.05 vs group R.
NEFF TA, DOELBERG M, JUNGHEINRICH C, et al. 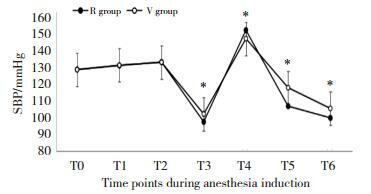 Repetitive large-dose infusion of the novel hydroxyethyl starch 130/0.4 in patients with severe head injury[J]. Anesth Analg, 2003, 96(5): 1453-1459.